Gastroenterology Dept, AZ Sint-Lucas Gent. Frederik de Clerck qualified as MD at the Ghent University in 2010. In 2016 he graduated as a gastroenterologist. He started working in the AZ Sint-Lucas hospital in Ghent where he is a staff member at the Gastroenterology department since November 2017. Besides general gastroenterology, he has a special interest in endoscopic ultrasound and neurogastroenterology. 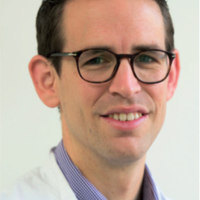 He is consultant at the Leuven University hospital at the neurogastroenterology department. He is a member of the VVGE (the Flemish Society of Gastroenterology), BSGIE (the Belgian Society of Gastrointestinal Endoscopy) and ESGE (the European Society of Gastrointestinal Endoscopy). He is currently secretary of the young VVGE. His scientific interest led to several publications in pear reviewed journals. He lives in Ghent together with his wife. Main hobbies are mountainbiking, reading and travelling.